Moona isn’t giving up until she’s a howling success. As she was leaving, Moona’s sharp hearing picked up the celebrations coming from the fairy queen’s reception hall. Not long after that a large black dragon met her at the veil and walked along with her as she headed toward her pack. He claimed to be Elenora’s mate and assured her absence was only necessary until the new queen and king had thoroughly stomped out all those opposed to their rule. After seeing her safely delivered, he nodded to Jared and left. Leaving the land of illusion wasn’t really a problem for Moona. She was done with the fairies anyway. However, she still had no intentions of returning to her pack. Her willpower wasn’t going to be enough to save her from acting out her stupid fantasies with their alpha. Jared was seven feet of lean muscle with eyes the color of the sky and hair the color of the sun. Moona had watched that lean muscle develop from childhood to adulthood. She’d run like hell when her interest in his muscles had grown too large. As if to prove that very point, Jared snatched her up in his arms in relief. It made controlling her emotions instantly ten times worse. His possessive grip on her curves always reminded her of the one moment of insanity she’d allowed herself in kissing him like there was no tomorrow. She hadn’t been able to touch another male since doing so. And given Jared’s physical reaction to her, he was having a similar problem. She was over six feet herself with her fair share of female assets. She wore her clothes loose and her hair long to tone down her femininity, though those things had never stopped determined males, especially not the one holding her. Jared had watched her grow up too. The longing in his eyes had nearly sent her running into his arms more than once. He’d been hurt when she left the pack to live with Willa, but it had been a matter of self-preservation. Plus, it had kept disgruntled pack members from picking on her supporters. Afterward, she and Jared had gone years without exchanging a word, but then something always drew them back together. Like today when he’d come running to make sure the fairies hadn’t hurt her. “Thank the ancestors you’re alive, Moona. Seeing the dragons here, I feared the worst,” he said. His tight embrace turned her brain to mush, which was worse for her than the loss of air. But she was not the right she-wolf for him, and at the rate she was going, she was never going to be. It was getting harder and harder to keep hoping her wolf would finally make a physical appearance. The deal she just made with the Jezibaba might well be her last chance at discovering why it had never happened. “To do what? Be their next meal?” Jared demanded as he set her on her feet. Moona carefully backed away a few steps. “No. To make them a new salve for their accidental burn victims,” she lied as she stepped even further out of reach. Moona ran agitated hands through her waist-length hair. “It doesn’t matter what you or I believe, Jared. No one else believes and you have to lead the pack. That’s what my Dad would have told both of us. You being pack alpha is what I want,” Moona said, not giving in to her need to hug him close. There had been an abundance of males in her sixty years of life, but this was the only one her soul had ever longed for. Before she could prevent him from acting, Jared’s demanding kiss staked a public claim she badly wanted to give in to. She lifted an unsteady hand to his face and wondered what other pleasures she’d find in his arms. When he finally set her free, Moona shook her head and backed away. The flash of pain in his gaze stabbed at her heart, but she had to be strong for both of them. He deserved so much more than she had to give. “Take care of yourself and watch your back,” she whispered. Then Moona turned on her heels and walked away from the wolf she loved. The young female bobcat threw her tail up in the air and hissed at her. It was a light brown, striped thing with ugly tufts of hair sticking up over each chewed-up ear. Sha had just shown up one day with a collar around her neck stating her strange name. Some poor human had no doubt tried to domesticate her. Given Sha’s attitude, it probably hadn’t taken long for her previous owner to realize she was made for the wild and not a litter box. Keeping some sort of tabs on her, Sha came out of the words and followed her whenever Moona left the house. The bobcat yowled and whined every five seconds when herb gathering was involved, but hissing was new. And it was getting on her last nerve. The next yowl was hair-raising and hurt her eardrums. She didn’t have to understand bobcat yowling to know what Sha was carrying on about. Her witch mentor had been sneaking Sha treats and winning the annoying feline over. She stepped over to the mudwort and lifted her shears. She focused on saying the words correctly as she made each snip. “With these blades, I claim your gifts. Blessed plant, all pain please lift. I use your leaves to heal the sick. In ending the pain, let’s both be quick. Through great Gaia, you came to me. She repeated the healing charm over and over until she had filled the corner of her basket with a large pile of mudwort. “There, Sha. I chanted over it. Are you happy? Good. Go tell Willa,” Moona ordered. Her blinking, yowling audience took off running at her words. Moona carried the overflowing basket of freshly picked herbs out of the forest and back to the tiny house she shared with the pack healer. Willa’s cottage was picturesque and looked like it belonged in a human fairytale, as did the ancient human diligently sweeping dirt out of the house’s back door. 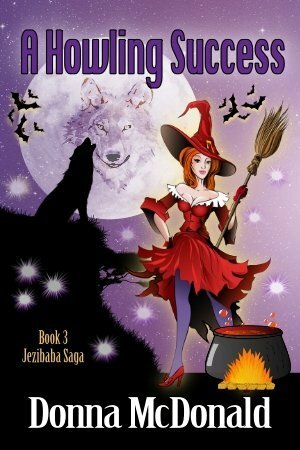 Willa swept with a broom she’d made herself and one Moona knew was warded against all manner of evil. The daisy-covered apron Willa had tossed on over her drab green housedress made her look like some human’s cookie-baking grandmother. Except Willa couldn’t bake worth a damn. Any cookies in Willa’s house were ones Moona had made. Visitors should be grateful for that fact. What her healing mentor needed to pull off a true witch vibe were a black hat and some equally dark clothes. “You shouldn’t be outside looking like a fifties housewife, Willa. People might say that’s false advertising. Where’s your black hat and ceremonial robe?” Moona teased. She laughed at Willa’s middle finger reply to her question before she disappeared back into the house. By the Ancients, she loved that crusty old woman. Willa was a naturally evolved witch, which Moona had long ago decided was a fancy way of saying Willa hadn’t been born into a family of witches like most witches were. Instead, Willa had gotten her witch powers when she was in her middle thirties. No matter how many times Willa told the story of her witch beginnings, she still sounded surprised that she’d just woken up one morning and her magic had been there within reach. Moona never minded each retelling because she found the story incredibly inspiring. She liked the idea that there were other creatures in the world who were late bloomers when it came to destiny. All her life, she’d felt like her wolf was just outside of her reach and held back by some invisible wall she hadn’t been able to find a way to move. In her mind, she and Willa were kindred souls. Willa must have felt the same way because her healing mentor had insisted Moona live with her after she’d officially left the pack’s little village. Moona traveled a lot in her search for answers to her shifting problem so she wasn’t home a lot anyway. Or at least that used to be true. Lately, she picked up more and more of the healing tasks for her pack. “I’ve never known the Great Mother to get involved with fairies all that much. But she’s an enigma, Gaia is,” Willa stated. “I tried to tell you Queen Arraign was never going to help you. She hates anyone who isn’t a fairy. I hope the new queen isn’t like that,” Willa said, wagging a finger. “And I told you I’d make a deal with the devil himself to fix my problem,” Moona said. “People come here for healing help, not for social calls. I’m sure it’s for that,” Moona said as reassuringly as she could. Friend or foe, she and Willa would deal with them together. “You look like a human witch to be feared and respected. That’s a very good thing to have accomplished in your life,” Moona said firmly. “You’re not alone. I live with you—most of the time,” Moona said, but her heart leaped at the thought of Jared coming to see her for her birthday. She knew he wouldn’t though, not after she’d shut him down in front of so many pack members the other day. Even a determined wolf like Jared had his pride. Unless you counted her. Moona had no pride. She only had curiosity and a soul that demanded answers. Knowing what was stopping her from shifting would be the best gift of her life no matter the age she’d reached. “I’m going to tell Sha to stay with you while I’m gone—just in case someone unfriendly does stop by,” Moona said as she headed out the door.